Marking Guillermo Del Toro’s first directorial effort since Hellboy II: The Golden Army (he was originally attached to direct The Hobbit: An Unexpected Journey before departing due to MGM’s financial difficulties), Pacific Rim is a surprisingly sprite blockbuster that works well as a throwback to the classic 1950s and 60s Japanese monster films, but is ultimately let down by a calculable narrative, questionable performances and over-the-top action. When a temporal rift in the ocean causes alien creatures known as Kaiju to wreak havoc on Earth, humanity are forced to build Jaegers, enormous robots powered by two pilots whose minds are linked, in an attempt to defend themselves. 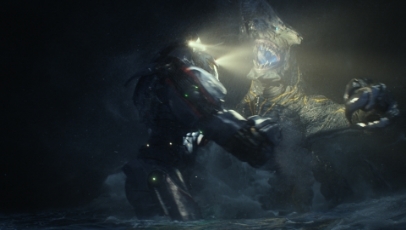 Initially, the Jaeger are successful in holding back the Kaiju. But as they adapt themselves and become stronger, it’s left to two unlikely heroes – Raleigh Becket (Charlie Hunnan) and Mako Mori (Rinko Kikuchi) – to destroy the portal and save Earth once and for all. For those ten year old’s inside us all, Pacific Rim is – to a certain extent, at least – the blockbuster we’ve all been waiting for. Packed with massive, hulking action sequences that see robots and monsters battling it out against the backdrop of Hong Kong and other major landmarks, the film is a well-paced and, at times, jaw-dropping slice of surface-level popcorn entertainment. The technological aspects are fantastic, even down to the smallest details (the robots have a battered and bruised aesthetic to them). It’s a shame, then, that what’s underneath all the mayhem and destruction is far less inspired and compelling. The script, penned by Del Toro and Travis Beacham, can only be described as a haphazard amalgamation of increasingly ludicrous and paper-thin elements. From underdeveloped characters (Robert Kazinsky’s Chuck Hansen has no redeeming characteristics whatsoever) to emotional beats that fail desperately to add weight to the narrative. Humour is attempted – and sometimes achieved – through supporting characters such as Ron Pearlman’s shady black market dealer Hannibal Chau and Charlie Day’s Dr. Newton Geiszler. But, while these moments are sure to elicit laughter from the audience, they feel misjudged and out-of-place in the grand scheme of things. Even Hunnan, who’s by far the most interesting character and has the greatest obstacles to overcome, is cast aside in favour of the ensuing mayhem and carnage. This all adds up to a film that feels inconsistent, sluggish and starved of depth, which is odd given Del Toro’s track record. But then, it feels harsh to judge Pacific Rim too much considering how oddly entertaining it is and how well it’s shot. It may not be the film many were expecting it to be after the hugely impressive trailers that came beforehand, but Pacific Rim is exactly what some people go to the cinema for: pure indulgent and over-the-top escapism.